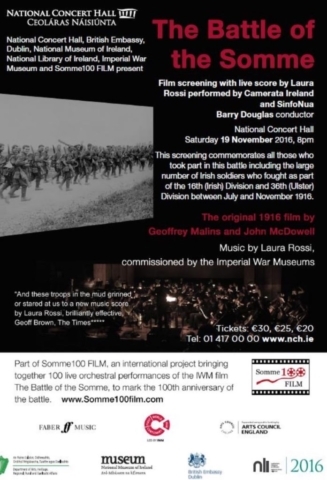 On Saturday 19 November 2016, to mark the centenary of the end of the battle of the Somme, the iconic 1916 UNESCO-listed historical film The battle of the Somme, by cinematographers Geoffrey Malins and John McDowell, was shown on screen accompanied by Laura Rossi’s acclaimed score performed live by orchestras Camerata Ireland and SinfoNua under the baton of conductor Barry Douglas. This screening commemorated all those who took part in this battle including the large number of Irish soldiers who fought as part of the 16th (Irish) Division and 36th (Ulster) Division between July and November 1916. It also incorporated a History Ireland ‘Hedge School’ debate. 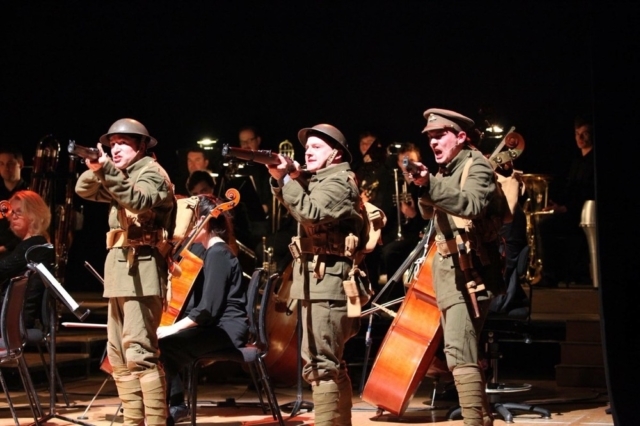 Laura Rossi’s score, which was commissioned in 2006 to mark the 90th anniversary of the Battle of the Somme. 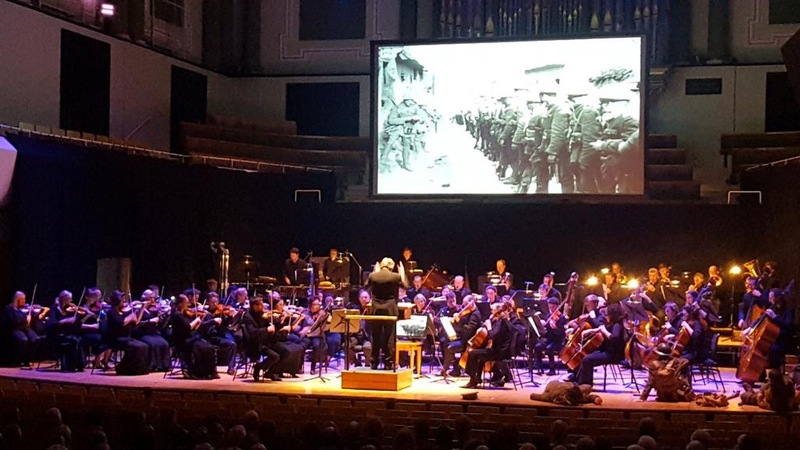 The event was further enlivened by a performance by Anu Productions, recreating the experiences of the Royal Dublin Fusiliers as well as readings by Dermot Bolger of his favourite war poems. The showing was preceded by a History Ireland ‘Hedge School’ debate at 6pm in the Kevin Barry room, chaired by Tommy Graham with Dr Kevin Rocket (TCD), Jennifer Wellington (UCD), Lar Joye (National Museum) and Tom Burke (Royal Dublin Fusiliers Assoc. and UCD) . 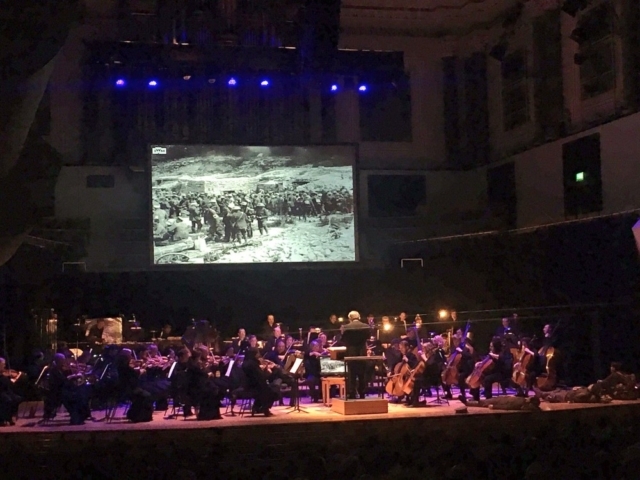 Dublin, 12 September 1916 – A new film showing images of British operations at the Somme has been playing to large audiences at Dublin’s Theatre Royal. The film arrives in Dublin from England where it was a source of some controversy. A number of public figures, including the Dean of Durham, voiced reservations about the sensationalising of the war and the impact on relatives and friends of soldiers being confronted by the harrowing realities of life in the trenches. Against that, the King has stated that ‘everybody ought to see these pictures’. The Irish Times supports the showing of the film, but due to its graphic nature the newspaper has urged the managers of Irish theatres not to sandwich the Somme film between ‘comic films’ and ‘variety turn’. The film shows men falling dead and the effect of artillery pounding German trenches, it also illustrates the preparatory work that goes into the launching of such assaults. Regrettably, from an Irish perspective, not all of the Irish regiments appear in the film as they were elsewhere engaged when the camera was in range.